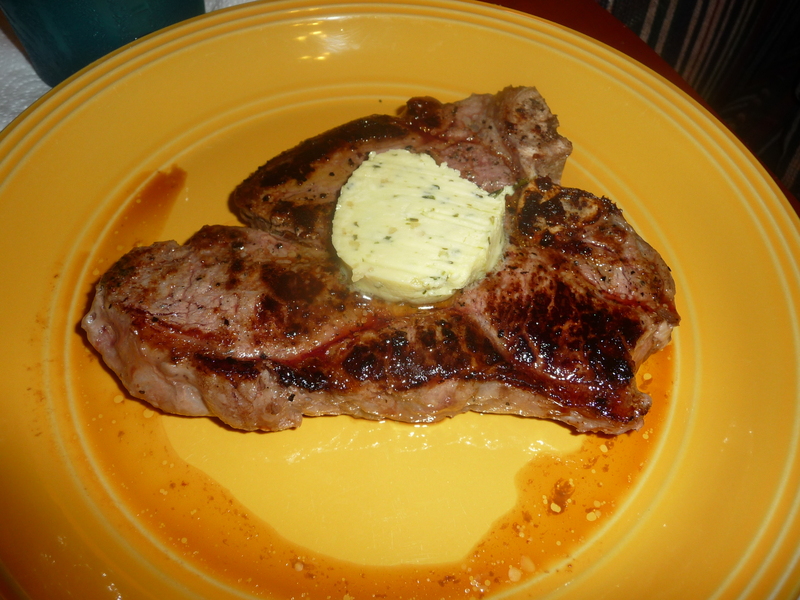 Seen here served on another of those t-bone steaks I previously mentioned I had found on sale. Another way to up our fat intake. Make ahead and store in the refrigerator for a delicious and versatile way to pump up the fat to get and stay in ketosis. I’m keeping the list of ingredients non-specific because the sky is literally the limit — make however much you need/want to have ready to go, and flavor with amounts of garlic and your choice of herbs to your taste/whatever you have on hand. Place butter in a mixing bowl and cover with plastic; let it sit out until soft. Add garlic and herbs; stir them into butter until worked evenly through. Spoon butter mixture onto waxed paper or plastic wrap and shaped it into a log about 2″ in diameter. Seal ends and refrigerate until use. Once butter is firm, cut a slice and place it on hot meat (or veggie) just before serving.